Key companies that hire from our campus are probably around 30-40. The average salary per year is around INR 3 lakhs per annum. Although the highest is INR 6 lakhs. No proper Internship. There is a good place for IT such field, but their was no such placement for other branch. The Training and Placement cell in was established with a prime objective of creating career opportunities for promising TKR students in reputed corporates towards meeting aspirations of all the stakeholders. To accomplish this career objective placement cell has identified corporates in various sectors and initiated the process of building a mutually rewarding relationship with them. At present the placement cell has an exclusive built up space of 4000 sqft which is well furnished with all the state of art facilities like conference hall , home theatre, LCD projector, PA system and an office which is equipped with laptop, desktops, laser printers, handy cam, digital camera, invertors, air conditioners, exclusive rooms for group discussion, 6 exclusive interview panels and above all an air conditioned auditorium with a capacity of 500 students . In its 10 years of fruitful journey a total of 100 companies visited TKR Campus recruiting 3000 students from various disciplines. 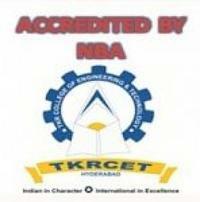 It is our endeavor to share the new milestones of TKR placement cell which has achieved highest placements in AP for INFOSYS in which 29 have been placed for the year 2012. TKRES is indebted to all the corporates who were instrumental in accomplishing the desired objectives. Infosys Campus Connect programme enables students to hone their soft skills to meet the industry needs.Wipro Mission 10X is aimed at developing teaching capabilities of various faculty members. We should be proud to be one of the few colleges to be selected for ‘SPARK’ program of Infosys. We are looking forward for good performance of our students in yet to come campus drives of Satyam and Cognizant.We have applied for empanelment of our college in companies like TCS and HCL.